It was the first time I’d seen honeycrisp apples in… I don’t even know. I eagerly paid too much, too early, for far too many apples. (I’ve never tried to keep my hoarding tendencies a secret.) So much so, that the cashier looked at me like there must have been some kind of a mistake. But to answer her question: Yes. There is something special about Honeycrisp apples. They are my very, very favorite apples. Sweet, beautifully crispy, and they actually taste like an apple should. Eat them straight from the shopping bag, make chicken salad, applesauce, or bake them into a slab pie. They work everywhere. When my HEB “Ciao Italia” Primo Picks arrived this month celebrating Italian food, I zeroed in on the Clementine Italian Soda. Central Market’s line of Italian sodas are some of my very favorite things in the world to make sangria (and margaritas) with. The Clementine Soda isn’t very sweet and it’s less carbonated (compared to “regular” soda) so it was perfect to knock the edge off of that bottle of budget, “too-sweet red” that I had stashed in the wine shelf for emergency sangria. 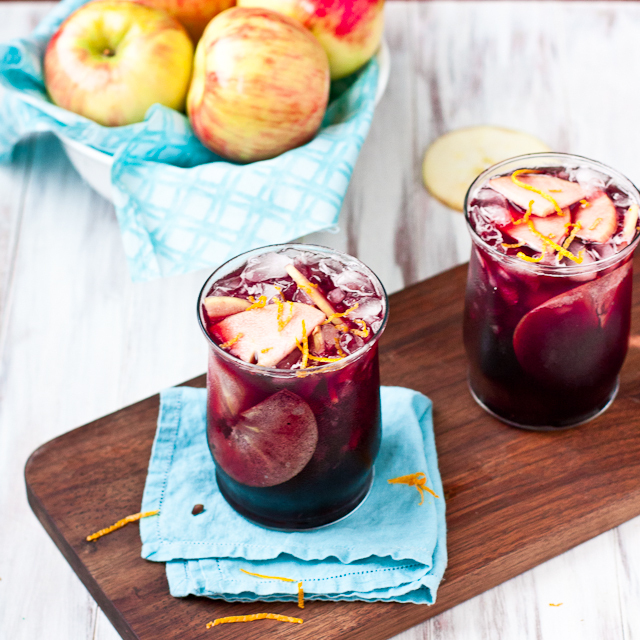 And if the sudden need to make sangria for football Sunday with some spendy first-reappearance Honeycrisp Apples doesn’t qualify as an emergency, then I don’t know what does. HEB has provided a selection of this month’s Ciao Italia Primo Picks to a lucky reader. To enter the giveaway, simply answer this question in the comments below: What is your favorite Italian dish or beverage? The lucky winner is Eva! Eva, please check your inbox for instructions on how to claim your prize! Besides Sangria? Carbonara, either traditional or in any of it’s many, many wonderful forms. 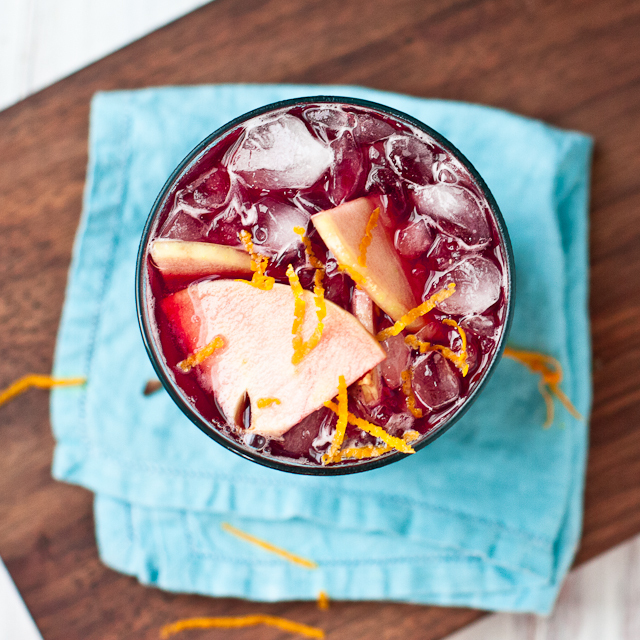 A fall sangria with sweet honeycrisp apples and clementines. Just before serving, add the clementine soda and taste to see if you require further sweetening. – Leaving a separate comment below that you follow us on Facebook. – Leaving a separate comment below that you follow HEB on Facebook. – Leaving a separate comment below that you follow the blog’s Instagram feed. – Leaving a separate comment below that you follow HEB on Pinterest. – Maximum of five (5) entries per person. – Giveaway ends at midnight (Texas time, y’all) on Tuesday, October 28. – Winner will be selected by one of those cold, soulless, unfeeling random number generator thingies and announced on this post. – Winners will receive a selection of HEB Primo Picks from HEB. – Winning “extra entry” comments subject to verification. This recipe was developed in conjunction with H-E-B and I was provided ingredients as well as compensated for my time. Messy fingers, stretchy-waisted pants, and baby-Elmo-clogged-toilets are all mine. You can find H-E-B on Facebook, Twitter, and Pinterest. And if you’re as lucky as we are, 3 locations within a 5 mile radius. This looks delicious! I can imagine you want to hoard those apples! Manicotti! Hands down. When we make it at home we put grated carrots & zucchini in the cheese filling for a little extra something. eggplant parmesan…my people don’t eat eggplant, so it’s a treat…oh and tiramisu, yum! gnocchi, light, fluffy and delicious! 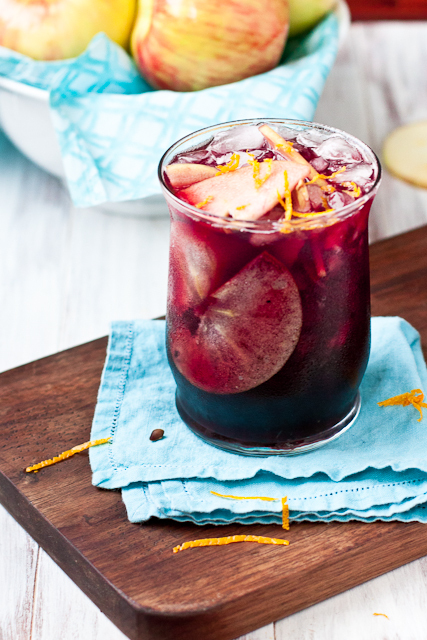 This sangria looks amazing! The color is gorgeous! So perfect for the Holidays. I already liked you before on Facebook. …. there’s no “love” option though. Prosecco! I also love the meats and cheese, Parm, Coppacola, Prosciutto etc. lord, any kind of pasta. i can’t pick, i really can’t. Pasta carbonara! Or maybe tiramisu? Too hard to decide! I follow HEB on Pinterest. Fettuccine Alfredo, pizza, lasagna bolognese–I can’t pick just one favorite! Can I just say “pasta?” With cheese. It must have cheese. Chicken piccata! Preferably with the addition of artichokes and prosciutto. Caprese salad with lots of balsamic. Cheese ravioli and meat sauce. Yum! Sangria looks great, can’t wait to try it. Definitely the different kinds of pasta, with fusilli in a pesto sauce topping the list of favorites. Zucchini carbonara in the summer. In the winter, the heavier and cheesier the better. My mother-in-law’s lasagna is the stuff dreams are made of. I follow HEB on facebook. I don’t eat pasta so my vote is for Sangria and wine. Lasagne and Italian Red Wine! A perfect combo – YUM!! !